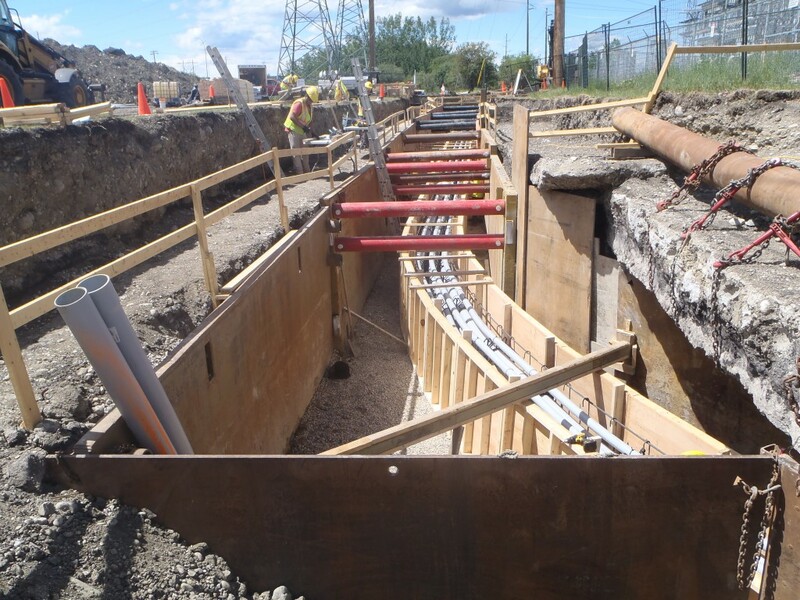 ENMAX 138kV Ductbank & Crossing Glenmore-Sarcee - Robert B. Somerville Co. Limited. Underground concrete encased PVC duct structure for two underground circuits for the 21.80L & 28.80L, 138-kV cables. Included all necessary permits, labor, material and disposal of materials necessary to install the duct bank as noted in drawings and specifications. Pipe augering 36″ steel casing under Sarcee trail at a length of 100m and 300m of concrete encased 8 way ductbank. The crossing was grouted after duct installation. The area of excavation greatly changed in sections, from an invert of 2.2m to 8.4m of cover. Various forms of shoring and open cut trenching had to be utilized to complete this scope of work.